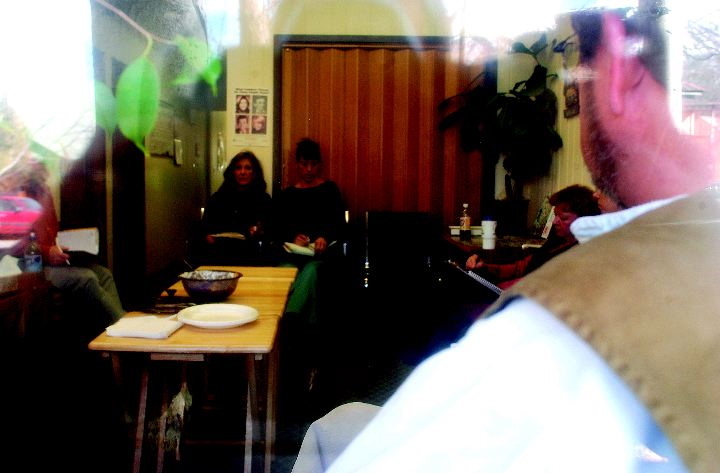 Viewed from outside, staff members at Colorado West Counseling Services hold a morning meeting recently at their Glenwood Springs location. Aspen Times photo/Mark Fox. Inside the Colorado West Counseling Services office in Glenwood Springs, it is easy to observe circles of support, frustration and, above all, hope.On Tuesdays, a visitor to the Pitkin Avenue office, which looks more like a home from the outside, will see a literal circle: the weekly staff meeting of people devoted to helping improve the lives of the valley’s mentally ill. A critical lack of resources is hampering the ability of local social workers’ to help the mentally ill, and a resigned resilience fills the workplace. The group carries onward.The subject of discussion is a young, drug-addicted mother suffering from paranoia. She missed two meetings with Colorado West social worker Bob Nuffer, who had called her and gone to her house. But still no contact has been made.The 10 people at the meeting, including social workers, case managers and office staffers, bat around ideas on how to connect with the woman. Perhaps go to her home earlier than usual? A good idea, except hanging around her residence may stoke her paranoia, one person says.Trying to help the mentally ill from Aspen to Parachute is an immeasurably difficult task. And the job has gotten much tougher of late.The budgets of state agencies across Colorado have been sliced in the last several years, the result of slumping local and national economies. Colorado West and similar groups have seen their funding reduced by 30 percent in the past three years, according to the Colorado Division of Mental Health. And trying to provide services far away from Front Range cities exacerbates the situation, says Lee Snyder, program coordinator for Colorado West’s adult community support office.”Certainly we lack in resources that might be in a more urban area,” he says. The Roaring Fork Valley is perilously short of mental health resources. Colorado West has just one bed at its crisis stabilization unit in its offices on Highway 82 east of Glenwood, and that is used mainly for people recovering from drug addiction. Other options for those needing a place overnight include a few beds at Valley View and St. Mary’s hospitals. But after that, few alternatives exist.Colorado West’s housing program for the mentally ill has been hammered by the budget cuts, meaning some people have to go an entire year before they can be given shelter. The state psychiatric hospital in Pueblo allocates the equivalent of six beds for the entire Western Slope, Snyder says.”It gets pretty severe [with] some of these funding cuts,” he says. “We had more of a housing program a year ago than we do now.”There’s just less money and more competition for it.”All this at a time of heightened focus on mental health after a high number of suicides in the valley so far this year, including the high-profile death of author Hunter S. Thompson.At least five people in the area have killed themselves in the first few months of 2005. Both Pitkin and Garfield counties have suicide rates well above both state and national averages, according the Colorado Department of Public Health and Environment. Colorado West is not alone in its problems with budget cuts, says Liz McDonough, spokeswoman for the state Department of Human Services.